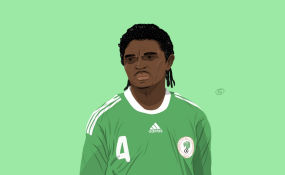 Former Super Eagles Captain and football legend, Nwankwo Kanu, is downcast at the renewed attempt to forcefully take away one of his most-valuable investments, The Hardley Apartments, situated along Waziri Ibrahim Crescent, on Victoria Island, Lagos State. The four star hotel has been a subject of litigation from some years, over an alleged default in transaction between it and Skye Bank (now Polaris Bank), leading to series of litigation that is still pending at the federal high court, Ikoyi, Lagos. However, Shina Philips a close friend and associate to Kanu told PREMIUM TIMES that the former African footballer of the year had to cut short his trip to London after hearing that some ‘unknown’ persons were carrying out illegal renovations in the hotel, contrary to the order from the court that both parties should stay off the property. “Yes, it is true, they have even made away with his football medals, trophies, plaques and other valuable items. For someone that has served and still serving this country meritoriously, he does not deserve this kind of treatment,” Mr Philips, who was with Kanu at the hotel, told PREMIUM TIMES. “He was in tears as we drove away from the hotel,” he added. Also speaking with the The Cable on the sad development, Kanu said he even struggled to recognise his property, adding that it was disheartening to see all that he worked for going down the drain in his very own eyes. “It was a rude shock to me,” Kanu, was quoted as saying by TheCable. “This is unacceptable in all ramifications. I have not been served any notice that I have lost this property and until I am served the notice, it remains my legal property,” the former Super Eagles’ captain was further quoted as saying. “Even cars and buses belonging to the hotel can no longer be found and I wonder where they could have been moved to without my knowledge,” Kanu further said, as he lamented how the four-year seal of the facility had affected treatment for numerous patients that his Kanu Heart Foundation planned to rescue from their ailment. “We have used proceeds from the hotel business to effect treatment for the patients over the years and now we are being forced to seek funds elsewhere, a situation that has stalled the treatment considerably, especially since 2016,” Kanu lamented.